Andy Carroll’s injured. Everyone else is rubbish. West Ham need a target man desperately or we’re getting relegated. Guess what? We’ve been here before. In the first of a new series, Sid Lambert (@sid_lambert) looks back at the strange selection of West Ham strikers that littered the 1990s. For ten years, Mike Small did little of note in professional football. After failing at Luton and Peterborough, he jobbed from club to club, enduring stints in Holland, Belgium and Greece in search of a regular home. There were brief flashes of success, including a short spell at Vitesse Arnhem in 1987, but little to suggest that he would succeed at a higher level. Finally, in 1990, the 28-year-old nomad pitched up in Brighton. Small battered his way through the Second Division, notching 21 goals in all competitions. His goals powered the Seagulls to the play-offs and convinced West Ham boss Billy Bonds to make a move for him. Bonds had guided us to the top flight at the second attempt. Ludek Miklosko, Colin Foster and Steve Potts had been stalwarts in the Second Division’s most meagre defence. However, goals had been hard to come by. Only Trevor Morley (12) and Frank McAvennie (10) had hit double figures on league duty and it took cameos from Iain Dowie and veteran Jimmy Quinn to get us over the line. With Dowie departed, Bonds needed a physical presence up front. Small fit the bill perfectly. He was in-form and, more importantly, very affordable at just £400,000. Incredibly, Small took that red-hot form straight into the top tier. He took just two games to get off the mark, scoring in a 1-1 draw at Sheffield United. In the next home game he scored as the Hammers beat Aston Villa 3-1. We had five points from our first four games and had only suffered defeat once. Things were looking promising. As is the West Ham way, that promise started to fade. But Small’s ruthlessness in front of goal didn’t. He scored in successive games against Chelsea, Norwich and Crystal Palace, where a precious three points kept us out of the relegation zone. It wasn’t just sheer volume, Small was scoring every type of goal: tap-ins, headers, one-on-ones. The Birmingham-born man was brimming with confidence. Everything he hit turned to gold. 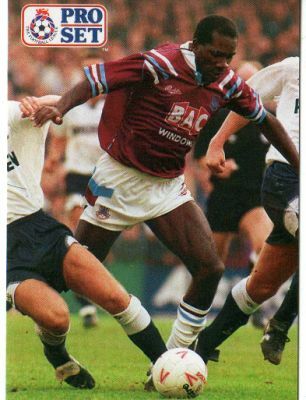 A seven-day spell at the end of October 1991 was Small’s finest hour in claret and blue. He scored the equaliser – cancelling out an early strike from Gary Lineker – as we beat Tottenham 2-1 at Upton Park. In midweek a penalty helped us to a 2-0 League Cup win at Sheffield United before we travelled to Highbury to face George Graham’s Arsenal. After absorbing heavy pressure throughout, the marauding Mitchell Thomas led a rare Hammers’ break into the Arsenal half. Tim Breacker fed the ball to Small, who easily eluded Tony Adams before unleashing a left-foot screamer past David Seaman. In a split-second he’d embarrassed two of England’s very best. West Ham won 1-0 and two successive wins against north London rivals put us into the heady heights of 14th place. Small had scored 13 goals in just 19 starts. That was a record to eclipse even the likes of McAvennie and Cottee. In just three short months he’d become a folk hero. By now, he was the country’s in-form striker and there were even whispers that Graham Taylor might consider him for England duty. The only thing to match his meteoric rise was the fall that followed. It took three months for Small to score again, a winner at Luton Town. By now, we were mired in the bottom three. Small’s confidence, like the team, had completely evaporated. The first touch was less assured and the finishing hesitant. Upton Park was an unforgiving place back then. Every moan and groan from the terraces seemed to weigh upon his shoulders. The big man was shrinking before our very eyes. He scored only three more times as we finished rock bottom. Small’s rapid decline is hard to explain. A niggling back injury didn’t help. But even when he was fit, he never rediscovered the form of old. He plummeted down the pecking order at Upton Park. Within two years, he was drifting aimlessly around Irish League football. Mention his name now and it evokes many a wistful glance from the West Ham fans that saw him, still struggling to work out where it all went so wrong. For three glorious months Mike Small was one of the best strikers in the country. Let’s try and remember him that way. As well as contributing to TWHW, Sid Lambert is a freelance writer specialising in 90s football. His new book, Cashing In, is now on sale. Set during the dawn of the Premier League, it tells the story of Ray Cash, a talented young player thrust into England’s top-flight. As money and fame change football forever, Ray encounters the ugly reality behind the beautiful game. I remember Mikey Small being a beast of a man when he was scoring for fun. His name was chanted on the South bank. I also remember him being offside a lot and looking very poor and sluggish afterwards….Amazing what confidence can do!